The story revolves around Athena Dizon (Kathryn Bernardo), a 17-year-old student, and Kenji Delos Reyes (Daniel Padilla), a rebellious teenager who is reputed to be a member of a local school Sindikato gang. They begin a false romance in order to spite Kenji’s ex-girlfriend, and Athena thinks everything will be fine. She slowly realises that her life is not as steady, as her relationship with Kenji inevitably transforms into something greater. I have found my favorite Filipino movie of all time (and probably one of my favorite movies of all time). 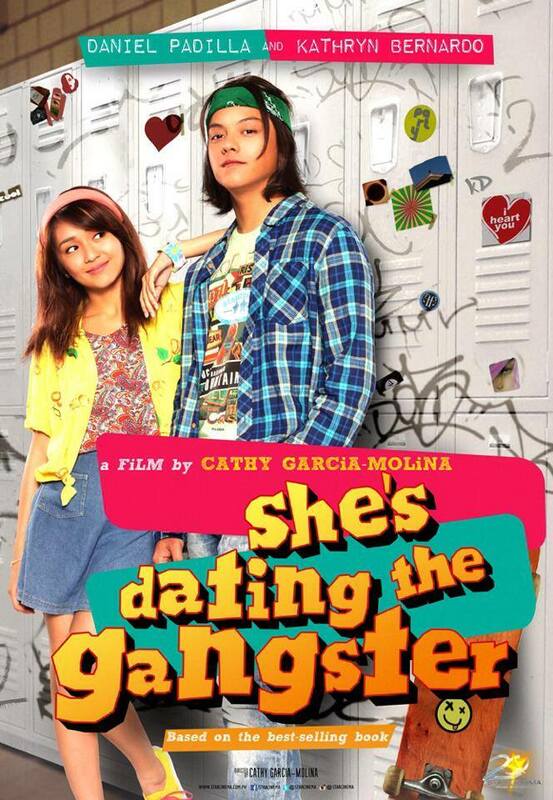 She’s Dating the Gangster (SDTG) is a movie based on a popular story on Wattpad. My first encounter with Kenji and Athena was when I first read the published book version (not the Wattpad one). After reading it, I was dumbfounded on what the “fanatics” saw about the story. I was okay with the general plot but what made me dislike the story was the “event” towards the end. I found it immature and it spoiled the whole story for me. Prior to watching SDTG, I have watched another movie based on a Wattpad story entitled, Ang Diary ng Panget (ADNP). While it wasn’t superbly done, I had enjoyed the movie a lot (even if there were a lot of things to improve on). A few weeks after that, I had learned that they were doing a movie adaptation of SDTG. I watched the trailer and was immediately disappointed with it. I can’t see the resemblance between the book and the movie and I thought to myself, even if the movie stars one of the hottest loveteams around, I will not watch it. I do not like the story and the trailer isn’t even that appealing, at least with ADNP, it gave me the feeling that it will somehow turn out good. A brief overview about my interest with KathNiel and Daniel Padilla: I am not a fan and I have not watched any shows that the two have appeared in. So there, another reason to cross SDTG off my list right? Fast forward to Friday last week. I decided to watch the movie with my officemates (was convinced to do so because of the positive reviews that I keep on hearing). I came in the movie house with no expectations whatsoever and I came out of it with puffy eyes and a heavy /happy heart because I have fallen in love with yet another star. SDTG (film) was so good that I had to watch it again the day after (Saturday), pretty crazy right? I am 24 and I am crushing heavily on Daniel, a 19-year-old boy. Why? I have never paid attention to him before and I was one of those who raised their eyebrows on the people who were obsessed with Daniel. Now, I am one of them. Second try: The scenes came unbelievably fast. It only goes to show how absorbed I was when I first watched it. In all honesty, the film touched my heart. I have never cried in any film that I watched on theater but I have cried loudly while watching SDTG (no kidding). The theater was jam packed with people, mostly teens, but it was me and my friends who were the noisiest. When Kenji and Athena were dancing and Athena then confessed her feelings for him and that awesome reaction from Kenji (it was so simple but it expressed a lot). I may have not watched any KathNiel shows but from that one reaction alone, I can tell that Daniel has improved a lot and that he is a great actor. The older Athena seeing Kenji for the first time in years (I was bawling at that point on). Dawn Zulueta appeared for like 5 minutes? But it has left the most impact on me, she is such a great actress. Even with a glance, she has managed to make me cry. It’s a film for everybody and I hope everyone could watch it. The reason I am writing this post is to tell the world to watch this movie. I am hoping that someone could sub this in english because I know that people from other countries would love SDTG. This is one Filipino film that we should be proud of. Never mind how the “critics” feel that this is a make-believe film, that it’s targeted the youth, blah blah. As long as a movie can make me feel, it is good enough. This is one of the few instances where the movie surpasses the book. I can go on and on about my love for the film but it may probably bore you, lol. If ever you got the chance to find a copy of this film with english subtitles (and you’re not a Pinoy), go watch it! p.s. I am so in-like with KathNiel that I am currently watching their last teleserye, Got to Believe. Their next will be Pangako Sa’Yo right? Can’t it come sooner? In the meantime, I’m contenting myself with watching all their clips on youtube. haha. Don’t be dissuaded by the trailer. One would think (myself included) that it is a “baduy” film at first glance (a lot of people were criticizing DJ’s hair) but the trailer barely touched the awesomeness of the film! I am thankful that I have watched it and I would have cursed myself if I did not watch it on cinema.